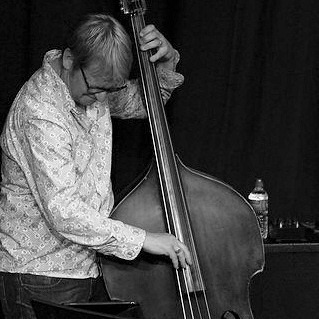 Geoff Gascoyne is one of the UK's leading jazz bass players, composers, arrangers and band leaders. He was born in Nottingham, England but moved to London to study painting at St Martins School of Art. Throughout this period he was still committed to playing music and shortly before he left art school in 1981 he joined his first professional group. In 1990 he joined the group 'Everything But The Girl'. Geoff's early jazz work was playing electric bass in the groups lead by Jim Mullen and Ian Shaw amongst others and it was in 1993 that, together with guitarist Malcolm MacFarlane he founded his first group 'Wabash.' It was at this time that he started playing the acoustic bass as well as focusing on composing and arranging. It was during a gig in Germany with Jim Mullen that he met Georgie Fame, an association that continues today. In 1996 he joined Guy Barker's International Group. In 1999 Geoff was involved with many more diverse projects including an appearance in Anthony Mingella's 'The Talented Mr Ripley'. Concert highlights were with Dianne Reeves, Ben Sidran and Norma Winstone as well as a night of Smooth Jazz with Dave Koz and Peter White. Geoff began devoting more time to his own music playing regularly at London's Ronnie Scotts with the new Quartet - Geoff, Ben Castle, Gareth Williams and Sebastiaan De Krom. From 2002 to 2006 Geoff worked exclusively with Jamie Cullum, recording 3 albums and touring the world. In 2011 Geoff performed with some great piano players, Michel Legrand, Phil Markowitz and Cyrus Chestnut and 2 great singers, Gregory Porter and Josh Kyle whom he produced a CD.